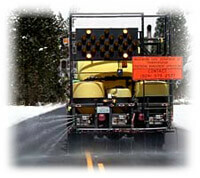 A fast-growing trend in the area of snow management is the use of liquid deicers to prevent the bonding of snow and ice to a pavement's surface.A Liquid deicer is a chemical freezing-point depressant, which should be applied prior to a snow storm as well as periodically throughout the storm. Such applications are a key element in an anti-icing program. Anti-icing programs involve the prevention of snow and ice bonding to a surface during winter months. In contrast to preventative measures of anti-icing, another common practice is to first allow an inch of snow to accumulate on the highway or paved surface then plow and treat the surface heavily with chemicals. Using such a procedure often results in needing a large amount of chemical abrasive because the snow has become compacted, making the bond harder to weaken. This particular practice of being reactive rather than proactive can lead to higher costs with less safe conditions, as compared to using preventative liquid de icers. This reactionary approach, however, will remain a prominent deicing technique as surfaces will always exist that were not treated preventatively. Whereas snow maintenance managers have traditionally deiced pavement surfaces after a snow storm, anti-icing requires advance planning before the storm arrives. If managers use an organized and systematic approach in their anti-icing programs, roads will be in the safest possible condition for winter storms. The program must consist of well-timed applications of a liquid deicer as well as good judgment in decision making. Anti-icing programs are best suited for roadways requiring a high level of service as the preventative features of the operations are most congruent with service levels requiring more frequent winter maintenance. There are numerous benefits believed to be associated with the use of anti-icing; such benefits include reduced maintenance costs and improved motor safety. Anti-icing programs are also thought to reduce the number of road closures and crash frequency. The decrease in automobile crashes leads to a decrease in insurance claims, injuries, and timely delays.The anti-icing program's use of liquid de-icers results in improved air quality as well as having decreased negative impact on water supplies; as compared to past methods of road treatment. Furthermore, using liquid deicers over other road treatment methods has been show to reduce negative effects on roadside trees and vegetation, making the product a good choice for protecting the environment. In general, anti-icing programs have shown advantages over rival snow management techniques in the areas of safety, mobility, productivity, and environment quality. Overall, anti-icing has become an important method of controlling the bond between snow and a surface area. This practice is gaining popularity as its benefits are weighed against those of traditional snow management practices. Anti-icing programs do require calculated timing and organized administrators; however, using this preventative method has proven advantageous over other methods of the past. This is of course taking into account the aspects of roadway snow management that involve safety, mobility, productivity, and environmental quality.In summary, if well managed, an anti-icing program will result in the safest possible winter roads achieved in an efficient, systematic manner. Other effective methods can be used like tailgate salt spreader and many more. Great for residential jobs, saves you time and energy. These electric heaters warm heat up in just minutes. Great for workplaces.